This topic contains 10 replies, has 4 voices, and was last updated by Mark Duffill 10 years, 2 months ago. 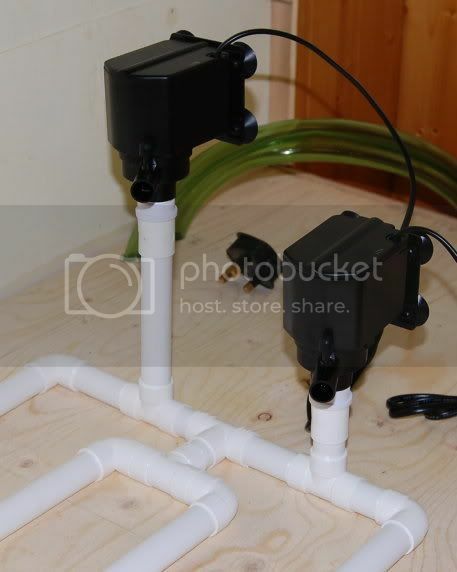 As asked for by Dunc, a few pictures showing how I built my river tank manifold. 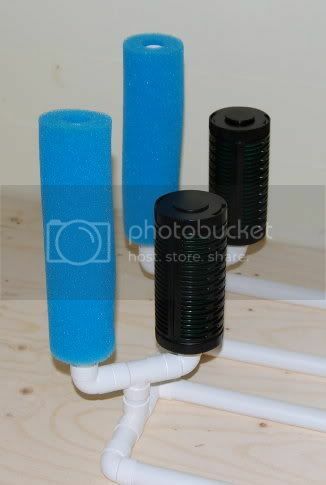 The first choice I had to make was the filtration side of things, either filter canisters or pieces of pipe with lots of holes drilled in with sponge slid over – I ended up going with the cartridges. 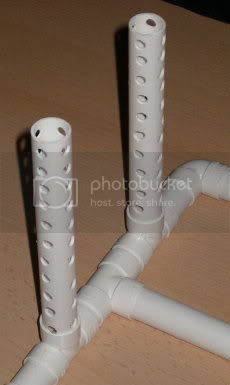 Some people have built these and glued the joints but I found that with this particular piping the joints are pretty tight and any that were not toght enough I added some thread tape to the pipe before pushing on the joint. That’s superb Mark, thanks very much. Where did you get your pipes? Am just gonna head to Wickes I think. Attaching the powerheads.. what did you do for that? I notice a bit of pipe to raise them off the ground.. then what did you do for actually attaching the powerheads to that bit of pipe? Did you botch something up or just use a special piece? The piece between the power head and the straight connector is a cut down section of one of these I just took the base of the power head with me and found something that fitted between both pieces. Did you get specific lengths of pipes for the long pieces? If so, what size? I fiddles around with mine quite a lot to keep the flow rates up and have ended up using these Sponges they seem to be very good and are a tight fit for the filter canisters. I have also added lengths of the 20mm pipe into the centres of the sponges like the pieces above that are full of holes which stops the sponges collapsing when they are full of gunk. I originally used an 8mm drill bit to drill the holes in the first pipes but this time I have used a 13mm flat bit which keeps the flow going a lot better and lets the water pass through more of the sponge, just drill as many holes as you can while keeping the pipe walls rigid. Ahh I see. Those cartridges just didn’t seem to be the answer. I went to Barratts but QUEL SURPRISE they didn’t have anything even remotely appropriate other than a square of pond filter media. I’m gonna try and cable tie it in to a circle as a temporary solution, just to see if the flow rates increase. If it works I’ll order a couple of the sponges you just linked – cheers. Nice one Dunc, you should see a big improvement over the other stuff in how long you keep good flow. I was using old style fluval sponges but they clogged faster than these I am using now.